Comments: Feather frond palm from Madagascar Island off the east coast of Africa. This species is marginal in our area as it prefers warmer weather and plenty of water. 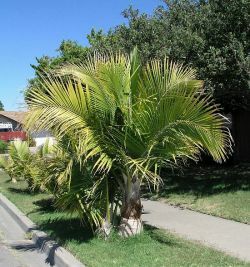 The specimen is planted between sidewalk and curb, and shows typical yellowing due to poor soils and lack of water. The species is fast growing and can attain a height of 30 to 40 feet.